Buy Green People Citrus and Aloe Vera Toothpaste 50ml in the UK from our online shop or directly from our independent Scottish store. Natural toothpaste with Aloe Vera, Lemon, Grapefruit, Orange & Myrrh. Where can you buy real Citrus & Aloe Vera safely online? If you are wondering where you can buy Green People Citrus and Aloe Vera Toothpaste 50ml safely online in the UK, then shop with us. 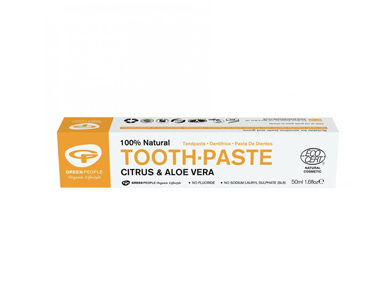 Citrus & Aloe Vera - Green People Citrus and Aloe Vera Toothpaste 50ml in Toothpastes and Dental Care.